Note: The post has been linked from http://techinfozone.net by permission of the blog owner. Description: In this blog i’ll explain how to transfer the site from my vps server to Host Gator Server having different ssh port and shared account. Follow the steps which are mention below. Step 1: Backup the WordPress database. 1) If you have installed the phpmyadmin on vps. Open the phpmyadmin and Click on the name of the database of the wordpress blog. 2) Then export the database. 3) Then click go button. 4) When it is completed save the file name database.zip or database.tar.gz in local download folder. Step 2: Transferred Your Site files system on the Host Gator Server. 1) Login to your server through ssh root@serverip then password. You have to use scp command to transfer the data on the server. scp myblog.tar.gz myname@serverip:/mydirectory/ is not working. 2. 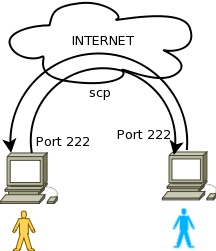 The destination server which SSH port is 2222 is shared server with cpanel access. How do I will transfer through IP. It will not work for me. 3. I will have to use scp port 2222 and instead of user@ipofserver i will use user@clientname. 3) Change the database name , user name and password in wp-config.php file. 1) Click on the import button in phpmyadmin. 2) Choose the file from local and click on the go button in phpmyadmin. 3) Change the URL in wp-option table, save it.